I developed an interest in hernia repair early in my surgical career through working with the comparative audit service at the Royal College of Surgeons of England analysing initial results of laparoscopic (keyhole) inguinal hernia repair. I also co-authored a study assessing the introduction of the Lichtenstein (mesh) repair for inguinal hernias, as well as a book chapter on the emergency management of abdominal hernias. For any particular hernia, there is likely to be more than one method or technique for its repair. With my experience in all methods, I will be able to offer the repair that will work best for you be it open or endoscopic (keyhole surgery), local or general anaesthetic. A hernia is a lump, bulge, or rupture through a disruption of the usual anatomical boundaries that contain it. The commonest internal hernia that most people have heard of is the hiatus hernia where the stomach can rise into the chest and cause heartburn, reflux and difficulty in swallowing. However, we will confine our information here to the more "visible" hernias of the abdominal wall the commonest by far being the groin hernias subdivided into inguinal (more frequent in men) and femoral (commoner in women). The large majority of inguinal and almost all femoral hernias should undergo an operative repair. Femoral hernias not uncommonly strangulate (part of the intestine becomes trapped in the hernia) and then require a higher risk, emergency operation. 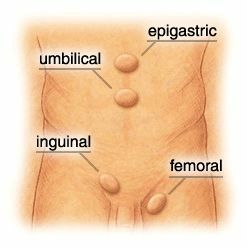 It is not easy sometimes for your general practitioner to confidently tell the difference between a femoral and an inguinal hernia. Even so-called asymptomatic inguinal hernias go on to cause problems for the majority of people. If you have a hernia, even if it;s not a bother, get it fixed. Otherwise, it will cause problems eventually. Other common hernias occur through weak areas of the abdominal wall at sites of previous surgery or where stomas have been created. These are termed incisional and parastomal hernias. One key reason why such hernia repairs fail is that they are fixed under tension and in my approach to incisional hernias I take into account the size and position of the defect as well as the patient's build and other medical problems including risk of infection. As such, there is no standard method of repair and I might recommend anything from a simple keyhole patch to a complex component separation including a biologic graft. My experience with stoma hernias has taught me that nearly all can (and should!) be treated via a laparoscopic (keyhole) approach using a reinforcing mesh. Frequent questions about the process.